We have a double header for this month’s program with John Jackson both demonstrating a trident maple root-over-rock technique and conducting a workshop—at the same time! A student of John Naka and Harry Hirao, John is one of our club’s most experienced bonsai artists (36 years in SDBC). He has deep ties to the Bonsai Pavilion at the Safari Park having been in charge of the construction of the current Bonsai Pavilion and its two predecessors and also being the current curator. 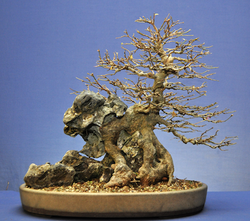 Anyone who has ever attended the club’s bonsai shows can attest to the stunning trees that John has displayed. Contemporary root-over-rock bonsai gives equal emphasis to both the dramatic rock and the draping roots so as to create a unified composition. Developing root-over-rock bonsai is a simple but time-consuming technique. So be prepared to learn how to spend the next 3 to 10 years developing your root-over-rock bonsai.